Sensei Stark is the founder and chief instructor of The Association of Traditional Shotokan Karate (ATSK), in Bedfordshire & Hertfordshire, England. He was born in 1965 in Kempston near Bedford, England. In the early 1980's he developed an interest in the martial arts and, after looking at Judo and Kung Fu, decided in 1983 to enrol at a local Shotokan Karate club run by Sensei John Van Weenen. 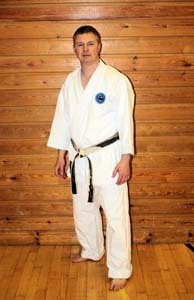 In 1988 Sensei Stark was awarded Shodan, and now holds the rank of Rokudan (6th Dan). In 1996 Kevin started a project to produce good quality information about Shotokan Kata, including the history and creators of each Kata. After two years he came up with a series of videos, together referred to as The Shotokan Karate Kata Videobook, which can now be purchased through this web site. In December 1998, after mainly training under Sensei Van Weenen for sixteen years, Sensei Stark decided it was time to move on and try to help further the advancement of Karate by setting up the ATSK.